True story: I finished crocheting my potholders for the hot pads and potholders swap on Memorial Day. It was a bittersweet moment: after my late start, I was happy that they were finished on time, but I was so sad to say good-bye to this phenomenally-rewarding project. My husband commented on my apparent drop in mood, and we held a moment of silence for the completed potholders. 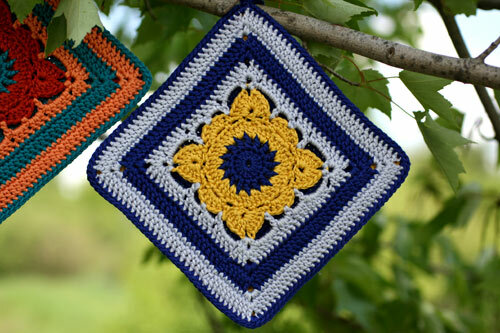 Pattern: from 200 Crochet Blocks , Willow (#189) for the front, and Solid Square (#149) for the back. Both were modified to be denser (and, by extension, to contain more rounds) than the original patterns. 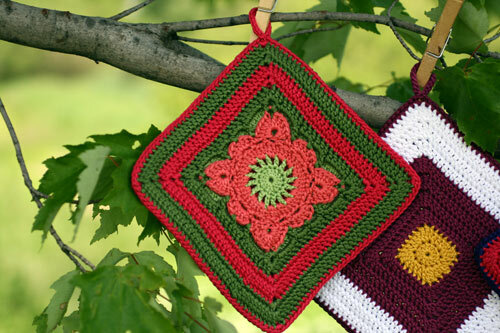 I wanted to mention that even though I ended up using 200 Crochet Blocks for my potholders (actual and practice ones), I found Beyond the Square Crochet Motifs to be a great resource for techniques – sliding loop start, joining new colors, moving from one round to the next, weaving in ends, etc. The Willow square had captured my attention from the very beginning – it’s delicate and dimensional, but not overly complicated or flimsy. It can be made with combinations of three colors. It has little “windows,” so one can play with the backing and what colors are peeking through. I can go on and on (it looks like I already have). Not surprisingly, other crocheters liked this pattern, too – look at this gorgeous set made by Color & Texture, and these combinations crocheted by Hillary. Love, love, love! Yarn: Tahki Cotton Classic, 100% mercerized cotton, 108 yds/50 grams. Less than 1 skein of each of the following: 3001 (white), 3352 (orange), 3407 (tomato red), 3418 (magenta), 3453 (coral), 3456 (deep pink), 3549 (goldenrod), 3701 (light green), 3703 (dark green), 3723 (acid green), 3786 (teal), 3873 (dark blue), 3933 (light purple), 3940 (dark purple). I absolutely loved working with this yarn – comfortable, sturdy, the right weight for this project, machine-washable, and dozens upon dozens of gorgeous colors! My camera often had a very hard time keeping up with the deep, saturated hues. Crochet hook: size C (2.5 mm) from this set (use code MAYA940 for 40% off). I know I’ve raved about this set before, and I stick to my opinion – it’s amazingly comfortable. Finishing and finished dimensions: I connected the front and back with a round of single crochet (per Maryse’s advice), and finished them off with a little loop. After that, I ironed the potholders – medium heat, lots of steam. The fabric was pretty flat even before ironing, but this polished everything up. The potholders are about 6.25-6.5″ squares. They are cushy and solid, and I hope they are thick enough for actual kitchen use. Last, but not least: crocheting potholders ended up being one of my favorite projects of all time. Who knew?!? I want to thank Adrian and Maritza for hosting this swap, and Maryse for her expertise and advice. A little at a time, crochet is becoming one of my favorite crafts, thanks in no small part to these ladies. Holy crap. 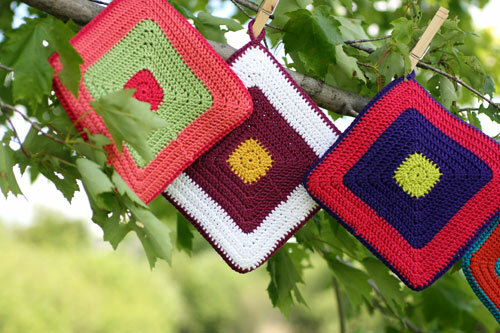 These potholders make me A) want potholders and B) to crochet. They look fantastic! 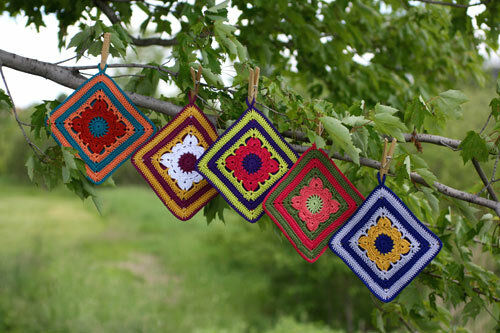 Beautiful potholders and wonderful photos! oh. my. goodness. they are spectacular!! I am in deep, deep love with your potholders. I’m currently scrambling to finish my own in time!! I have GOT to learn how to crochet. I love, love, love your potholders. Your color combos are yummy!! Gorjus! You have great color sense. I know I get annoyed when I make dishcloths for my family members and they treat them like gold and don’t use them, but now I understand. These potholders are really amazing. I don’t know that I could bring myself to use them–I’d probably just pet them and stare at them. Too lovely! Beautiful! I could crochet granny squares non-stop, I think. And I did! For the swap! Now I’m sad they’re gone, but I will be pleased as punch when I get my share of the swap! What fabulous fun colors! I smile just looking at them. 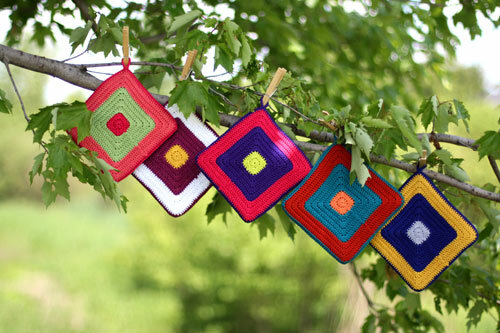 How fun it must have been making these gorgeous potholders. I want to get in on the fun, when is the next swap? BTW-The pictures are just beautiful. What kind of camera do you use? Where, oh where can I buy a tree like that? It’s so bright and cheery. LOVE the post. It reminds me of the great spaghetti tree hoax – only much happier. Wow, these are absolutely gorgeous! Both the potholders themselves, and also the photography. My eyes popped as soon as the page loaded. 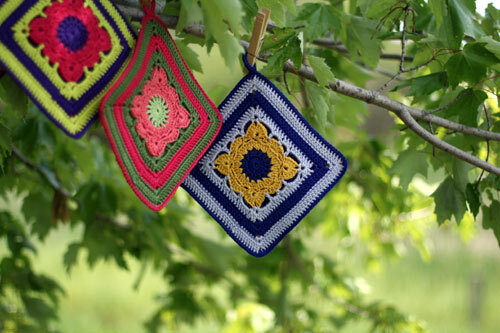 Congrats on a really stunning project and your budding love of crochet! Those are simply gorgeous! All that planning surely turned out a fantastic finished product. I really am going to have to get to crocheting…. I cannot believe how fabulous these came out. SO FABULOUS! Even the backs are amazing! FO’s like these potholders are the reason I am learning to crochet. holy crap thesse are nice! Beautiful work, as always. I love your vibrant color combinations. I like how you displayed them in the tree! I have been reading your blog for sometime, while I don’t even knit(I crochet). Now I like it even more. Very pretty. Love the color combinations! 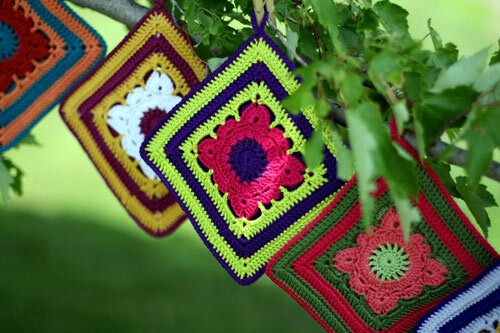 The potholders look great hanging in that tree! Very creative! My crocheting skills are limited, but I would love to knit these. I also, now, have the recommended books on my list. these are fantastic! and too beautiful for kitchen use but rather for hanging on the wall on display. again, as always, your work is gorgeous. those are so gorgeous. i love them and wish i was a part of this swap! Beautiful – and I enjoyed your journey through these. I’ve been crocheting since I was about 6, only knitting the last three years, and it has many things to keep me coming back to it — it’s incredibly FAST, it is extremely forgiving and there are a lot more fun stitches than in knitting. For a project like this, it’s perfect. And what lovely work you did! funny, I too chose the willow pattern for the potholder swap. i suppose great minds must think alike. Loving the way trees look in Boston. And the subtle ‘my husband commented’ reference to Mr Sweetness. Mmm…I love the one with the watermelon colors! Very colourful. And a good way to display them. 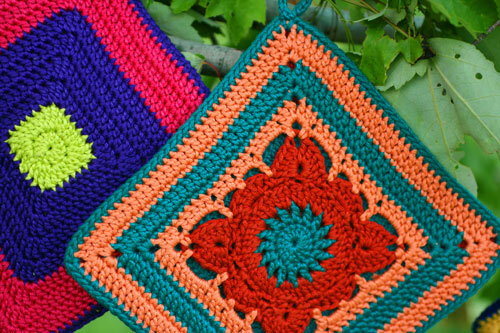 Lovely potholders and gorgeus colors! love love love. the green and blue color combo is amazing. maybe i’ll be lucky enough to get one of you lovely little works of art! What a great photo shoot! Wow. You’re making me want to crochet. That rarely happens. Lovely colors you’ve chosen! Lovely squares and great photos. Sometimes you don’t realize the journey that crocheting and knitting will take you. Crochet is cool. I’ve done it for years. Now I’ve learned to knit and it’s cool, too. — Grumperina, just like when you knit, it’s obvious that you are a perfectionist and a very talented color artist. These are wonderful potholders, and… wasn’t it a fun journey? I still need to mail mine off! Mine are more for hotpads (no hanging circle), but I used your yarn selections for inspiration when I was getting materials for the project. Whatever I get, they will be gorgeous and well loved! Whoa those are awesome. I’ve been wondering what to make a coworker for her wedding shower, and these would be right up her alley. Love your colour choices! I’m so thankful you’re entering the world of crochet and loving it. It’s timely in my own life, as I gravitate from years of knitting to the grand adventure that is crochet. I’m only able to sc and dc at this time, but find your posts inspirational. Thank you – for the encouragement, the resource suggestions, and other crochet blog posts. I’d love to know what other crochet blogs are out there. Google searches haven’t turned up anything as inspirational as your suggestions. I’d be happy to send it to you (a thank you for all the blog pleasure), if you’re interested. Shoot me an email. And I enjoyed seeing the potholders. They’re gorgeous. Oh WOW. Love, love, LOVE. You did such a fantastic job. Love these! Those are beautiful! I really like the fun colors. I love your potholders! Will there be a second round of the swap? Those are fantastic! You are making me want to learn to crochet. I must be on my guard. Love them! So sorry you had to say good-bye to them!